This is a TV commercial of Tokyo Gas. She cooks a bento only with her son’s favorite things, eggs, fried chicken, and hamburg steak. This is her first message to her son. She gives him the bento, but there is no reply from him. One day, she sees her son walking with his girlfriend and makes a bento with a big pink heart. She continues giving her son bento messages for three years during high school. And she finally cooks her last bento. It turns out to contain the “best three favorite” bento items she made in the early days. 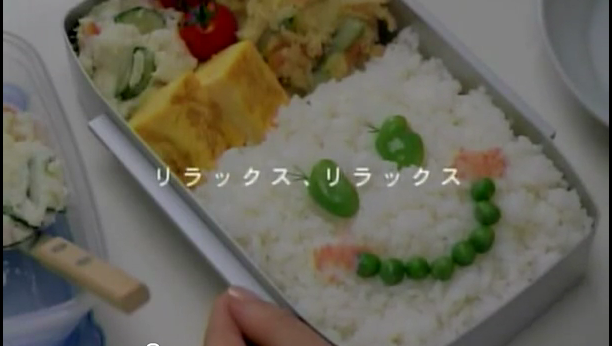 When she comes home, she finds a bento box with a memo from his son.